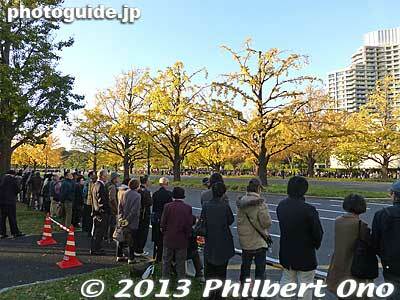 On Nov. 19, 2013, I took a friend from Hawaii around Tokyo and when we headed for the Imperial Palace, we saw this large crowd on the streets. 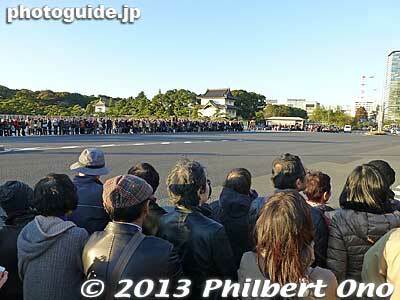 Most were middle-aged and older people. The palace was closed off to tourists as well. Couldn’t see the famous Nijubashi Bridge. I asked a bystander what was going on. She said they were waiting for “Caroline.” No mention of the last name. “Caroline” in Japan automatically means “Kennedy.” Although I always think of Neil Diamond’s song which coincidentally is about the Caroline they were waiting to see. So I stuck around for about 15 min. 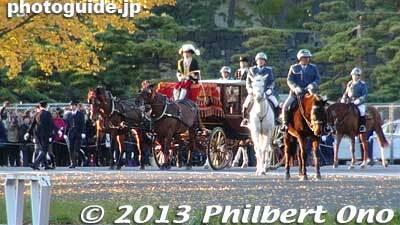 and sure enough, at around 4 pm, her horse-drawn carriage appeared after she had shown her credentials to the emperor. I whipped out my camcorder and still camera and started shooting. 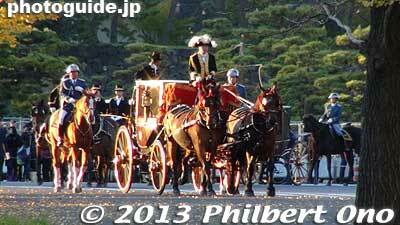 There were two horse-drawn carriages and I correctly assumed she was riding in the first one. No one waved Japanese and American flags though. 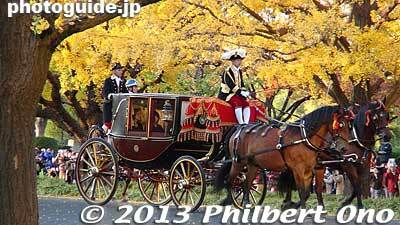 Fortunately, she was sitting on the right side of the carriage facing my side of the street. You can see her in this photo. Wish she waved to us. As soon as she passed, the crowd dissipated. We haven’t had such a star ambassador to Japan in a long time, not perhaps since Edwin Reischauer in 1960s or the beloved Mike Mansfield in the 1980s. Welcome to Japan, Sweet Caroline! Her husband Joseph Hardy Neesima or Jo Niijima had studied in the US and founded a Christian school which became the prestigious Doshisha University in Kyoto. Yae will be played by actress Haruka Ayase. I remember her in the TV series “JIN,” about a brain surgeon who went back in time to the Edo Period. She was quite good (for a former bikini idol). 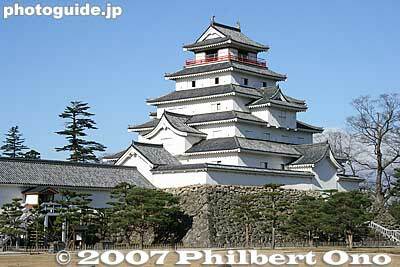 More photos of Aizu-Wakamatsu here. Always sad to lose a fellow Japanese/English bilingual person. Still young too 山口美江. Here’s a video (no longer online) reviewing her career in an interview.